Plaza Theatre Company has become a place where quality family theatre has been delivered in the heart of Cleburne, Texas since 2006. From Seven Brides for Seven Brothers to Smoke on the Mountain to Steel Magnolias, Plaza Theatre Company delivers quality family theatre year-round as well as opportunities for community actors to share their talent and passion. 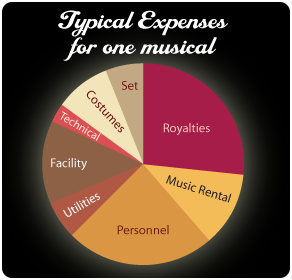 Why is Plaza Theatre Company is a great choice? As a 501(c)(3) non-profit community theatre, Plaza Theatre Company presents quality family theatre all year round, engaging hundreds of community artists each season. The Theatre's mission includes making theatre available through continuous performances, youth acting classes and children's theatre, and most importantly, affordable ticket prices. Your contribution goes a long way toward making this happen therefore, YOU make the difference. Won't you consider donating today? Your donation is tax-deductible and supports a worthy cause. Your donation is handled with the utmost care and includes all the necessary paperwork for making the donation tax-deductible. 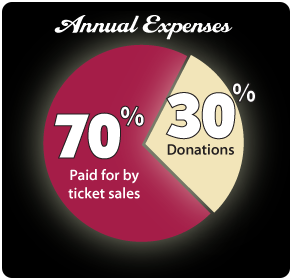 Contributions to Plaza Theatre Company are tax-deductible as it is designated a 501(c)(3) non-profit community theatre. Contributions are professionally managed and carefully utilized to quality family theatre.